Love X Stereo is a Korean electro/alternative rock band comprised of Toby (guitar), Annie (vocal and synth), and Sol (bass). Plugging away since 1998, the team originally performed as part of the skate punk outfit known as Skrew Attack (source: http://www.lovexstereo.com). Nevertheless, the band went through serious ups and downs. In 2005 Annie hopped on board, however, after a few years, they still weren’t able to attract attention to their music. You would have thought “what else could go wrong?”. Unfortunately in 2011 a sudden departure of the drummer, Lee Eung Kyun, caused more chaos in Screw Attack. Annie and Toby thought hard on what to do next and thanks to their determination and ambitions they have managed to build up a better future for themselves with a new band name, new sound and new bass player: Sol. Love X Stereo officially formed their trio in 2011, and since then they’ve impressed not only their local music scene but also fans of alternative rock overseas, gaining a following almost overnight. Since 2012 they’ve performed at various international music festivals and the trio is scheduled to play in the US again. I have to admit that Annie’s voice blew my mind when I heard her live. 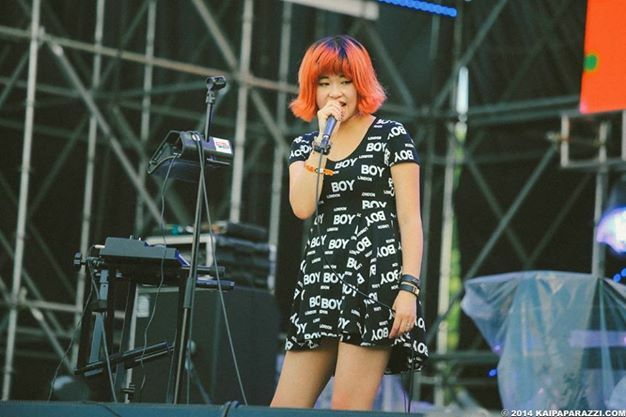 The band’s electronic punk rock sound is complimented excellently by her dashing charm and wonderful vocals. We were delighted when the band found time in their busy schedule to answer a few questions for us. VOTA: Let’s start by talking about your band. How did it all start? LXS: Toby started a skate punk rock band called Skrew Attack in the late 90s. After Annie joined the band in 2005, the music slightly changed into pop punk. We recruited Sol afterwards. Our drummer left the band in 2011, and we decided to change our sound and style drastically. That’s how Love X Stereo first started. Our music is very much influenced by the 90s, and we mix rock and electro to create interesting music. VOTA: As a band you went through some crucial changes, including the sound of your music. Are you both happy with the current line-up and music? LXS: Yes. We’re constantly evolving. VOTA: Can you shed a little light on who came up with the new band name? LXS: We all liked the word ‘Stereo’, Toby added ‘Love’ and we put an ‘X’ between. VOTA: What band and life experiences have influenced your songs the most? LXS: 90s alternative bands. We were all teens back then, and loved the unpolished, melancholic, chaotic, and effusive feeling about that era. Nothing was impossible, everything sounded so interesting and of course, we absolutely admire New Order. VOTA: Having been an independent band for years and with your music remaining consistently good, what would you say are the biggest obstacles in the indie music industry that you have seen around you? LXS: Money and infrastructure. As an independent band it’s great to do everything by yourself, but financially it could be really gruelling. Also, as an independent artist in Korea, we don’t have any particular infrastructure to cross over to other countries. These days, we see a lot of Australian and European artists getting big in the States, and they probably have a lot of professionals and labels working hard to do so. To connect to the world, we clearly need more knowledge and experience. VOTA: In 2012 you released your debut EP Off the Grid as Love X Stereo and in Autumn 2013 a new album which was promoted in the New York and Canada. What was the creative process like for those releases? LXS: Our debut EP is Buzzin’ (2011). We wrote our songs with a simple rhythm or riff. Started from there and elaborated. We made it sound grand. Annie always writes the lyrics and Toby produces the songs. VOTA: Are there any special traditions Love X Stereo has when preparing for a show? LXS: No traditions. Just good old fashion ‘break a leg’ motto. VOTA: You will be travelling to the US again, why is that? Have you got anything new in the pipeline? LXS: Going to the States is our way of connecting with the world. We’re reaching out, finding opportunities, and meeting our fans. In fact, our band was actually made to take our music outside of Korea, so we feel we should do it more often. Not only in the States, but all over the world. Our new single Hide & Seek will come out in September. You can take a sneak peek here (Courtesy of Balcony TV). Love X Stereo’s new album will be released in December or January. Keep an eye on LXS!